This delightful tour is a bit of a sleeper. It’s starts in Bordeaux, follows the Voie Verte Roger Lapebie to it’s end in Sauveterre, then goes overland along back-roads briefly to the Canal Laterale de la Garonne, which we then follow, more or less all the way to Toulouse. Along this canal is an uninterrupted bike path with no vehicle traffic at all. So, all but about the 20 km between Sauveterre and the canal is one long, glorious cycling paradise. The section along the canal is particularly beautiful. It’s a region that is relatively unknown to Americans, and of all the regions of France we’ve cycled, it’s one that only reveals it’s secrets to those who go slow. There’s a lot here, but it takes time to appreciate it. That said, this tour is a little different than some of our others, where we recommend staying at least two nights in each place, and include day trips. Many of the stops along this tour (Buzet, Agen, Moissac, Montauban) really only merit one night, but because the distance between them isn’t that great, it’s easy & pleasant to ride to each location in the morning, spend the afternoon exploring and set out again the next day. Depending on where you're staying tonight, you'll either stop in Sauveterre or continue on to the B&B in Saint Leger. We have a very nice day trip from Sauveterre if you’re interested in staying another night (we recommend it). From Sauveterre, we head south on back-roads (the only significant segment not on a bike path for the whole tour) and come to the Garonne river and the Canal Laterale de la Garonne where we head for Marmande, our first stop along the canal. There’s a number of choices for places to stay . We recommend two nights here, taking the next day to see Marmande. It’s pretty little town, with some interesting streets, a fine church and cloister, a nice river front and a beautiful garden. Worth a look! 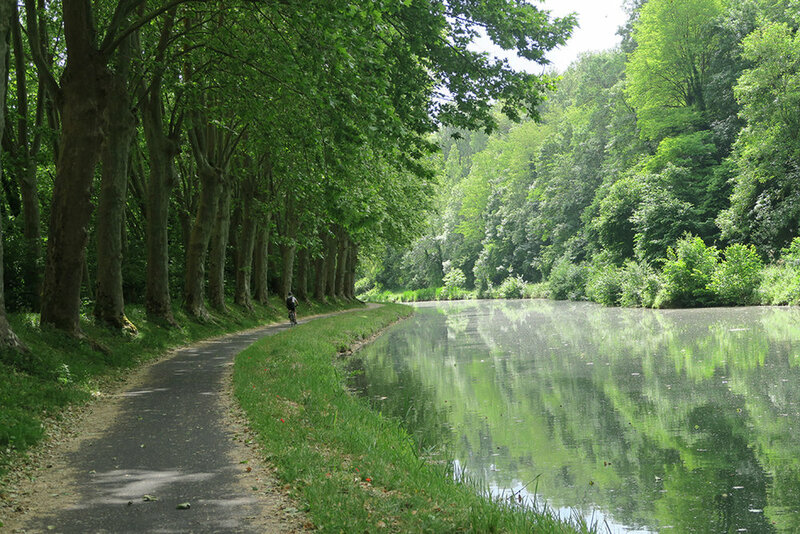 Next, we continue down the canal from Marmande to the little town of Buzet-sur-Baise. There a number of places to stay in Buzet, and a great place to take the wines of the region, little known outside of France. You'll be surprised. After Buzet, back on the canal to Agen, a pretty little town, with a great art museum, an interesting church, and a lovely old city center, all of which makes it well worth the stop. After Agen, we continued to Moissac. While it's also a pleasant little town, it’s crown jewel, the Abbaye Saint Pierre, alone merits the visit. From Moissac, its another relatively short ride to Montauban, first along the Canal de la Garonne, then a bit of detour up the Canal de Montech. Montauban, is a beautiful little city with lots of pink brick architecture so characteristic of the region. An apero in any one of the numerous cafes in the Place Nationale alone is worth the stop. From Montauban, it’s back down the canal du Montech to the Canal de la Garonne to Toulouse, a wonderful city with lots to see & do. Plan on spending at least three nights. Once done in Toulouse, we recommend taking the train back to Bordeaux, unload your bikes, and continue on from there. Fortunately, Bordeaux is a great place so it really isn’t much of a sacrifice.